Crystal waters stream down from the high mountains of the Great Pyrenees and wind through the bucolic country side of this small nation. Andorra is only 188 square miles and is nestled between France and Spain. This uniquely positioned country was granted independence from Charlemagne in 1278. Its government is the world’s only dual principality, also called a diarchy, with two heads of state; the President of France and the Bishop of Urgell. Andorra is also the only country in the world whose official language is Catalan, with Castilian Spanish and French also spoken. Its close to 80,000 residents are largely Roman Catholic. Andorra has no airport, military or currency of its own. 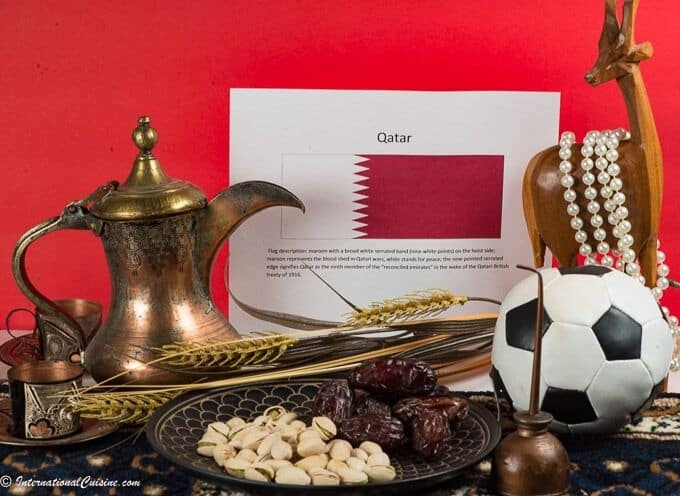 It is a tax haven and very popular as a tourist destination with its duty free status. The male citizens of Andorra, between the ages of 18 and 60, would be called upon to take up arms and defend her if there were a crisis, but that has not occurred in over 1000 years. 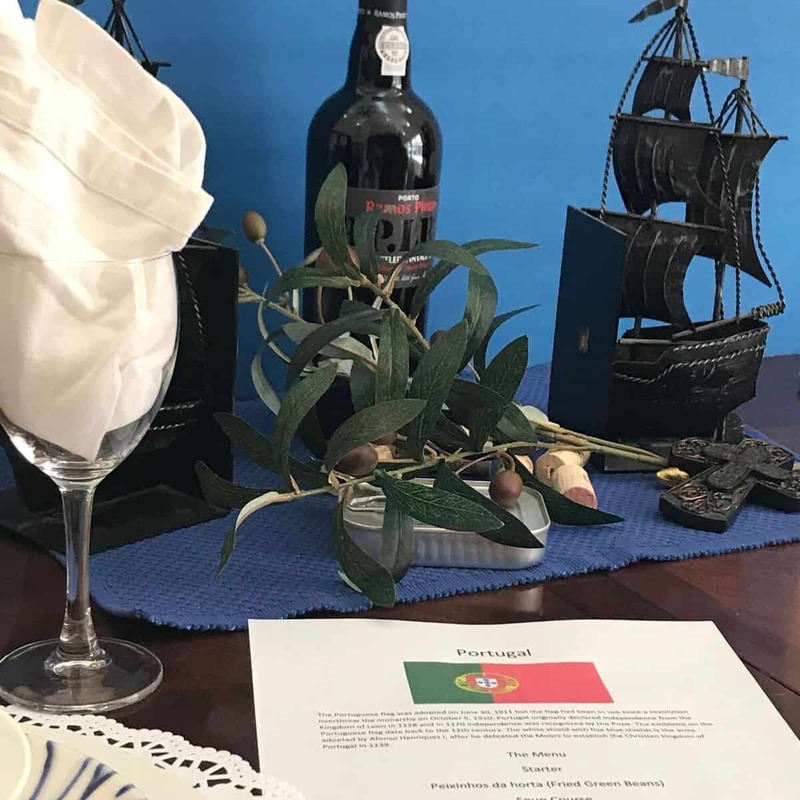 As you can imagine, the cuisine is heavily influenced by its neighbors, France and Spain. Yet Andorra has some unique flavors of its own. Due to the mountainous terrain, it has a surprisingly low amount of arable land so Andorra imports many food items from her neighbors. The main crops harvested there are tobacco, wheat, rye, barley, oats and vegetables. The people of Andorra love to celebrate and have many festivals and holidays. The national dish of Andorra is a stew called Escudella. This very hearty stew has numerous ingredients such as beans, ham, chicken, pork sausage, cabbage, potatoes, rice and pasta. What I love about this dish, is when there is a celebration, a giant vat of Escudella is served for the whole community to partake. Everyone is welcome to have a bowl. What a wonderful tradition of community. How nice it would be for other cultures around the world to embrace such camaraderie. Andorran’s love to hike up into the mountains and forage for mushrooms, wild herbs and berries. Andorrans have long been referred to as mycophilics, or mushroom lovers. 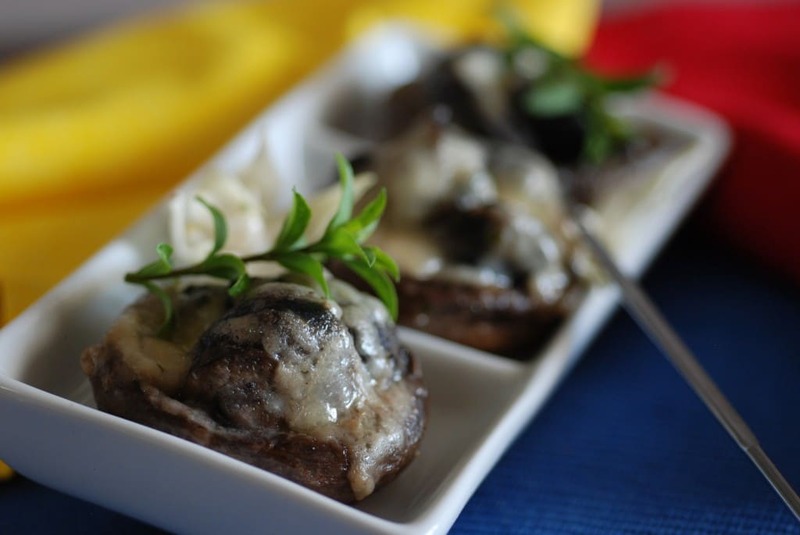 In fact, traditional restaurants in Andorra will serve three course meals featuring nothing but wild mushrooms during times when they are most abundant, from September to November. Andorrans have the honor of having the longest life expectancy on the planet. The average Andorran can expect to live at least 85 years. I am not sure if it is the altitude, the foraging and hiking in the mountainous terrain, the good natural food, crystal clear water, or just the stress free living. Perhaps it is the unusual sense of community and closeness to friends and family. Whatever it is, I am certain there are excellent lessons to be learned. You will find a lot of bread plates served in Andorra. Instead of serving bread with butter, they rub garlic and mash fresh tomato on warm slices of grilled country bread. They call it Pa Amb Tomaquet. 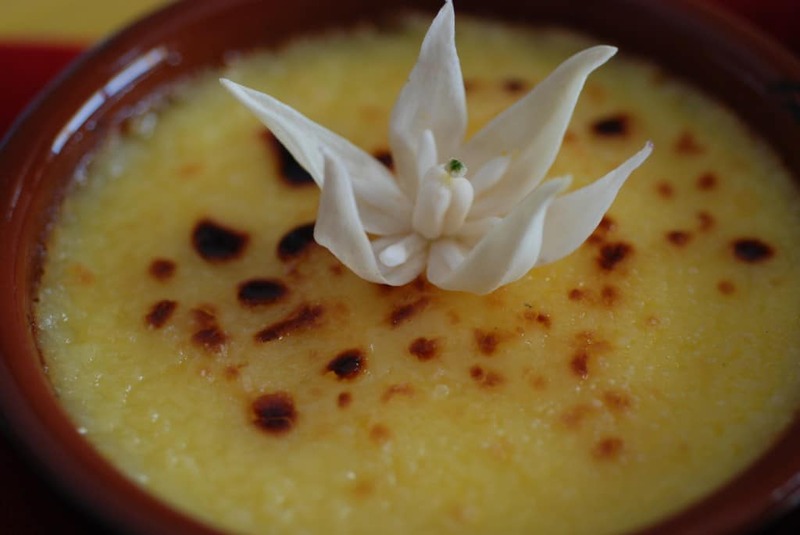 There are so many incredible choices to represent Andorra, finding something delicious is a cinch. I hope you will enjoy my picks as much as we did! 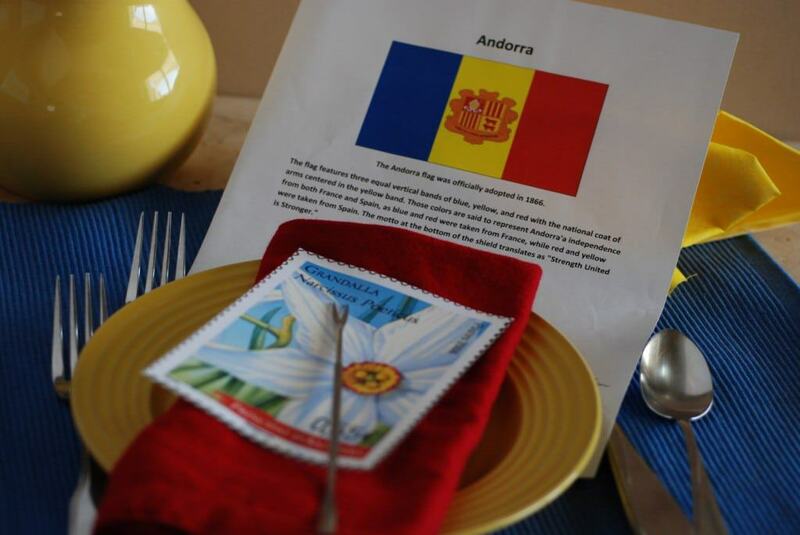 The colors of the Andorran flag were used in the table setting; red and yellow from Spain and blue and red from France. We began the meal with the escargot and mushroom appetizer. I really wanted to make cargols, which are small live snails charred in wood or coal ovens and are found everywhere in Andorra. However, I could not find any live ones in my vicinity. The canned version still worked really well. They were stuffed into the mushrooms then covered in the traditional minced garlic and melted butter. They were spectacular. Next on the menu was the whole trout, cooked on a piece of slate over the grill. Andorrans cook many meals on stone and using the slate made for an incredible presentation for the main course. Fresh herbs and lemon flavored the flesh. 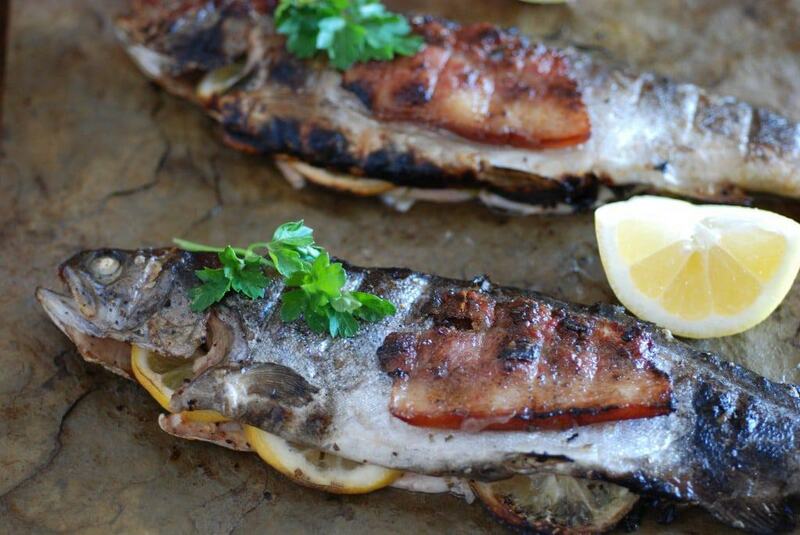 The fish was cooked perfectly so that tender pieces of trout just fell off the bone. The side dishes of the Trinxat (cabbage and potato)and Espinaca (wilted spinach) were wonderful accompaniments to the trout. 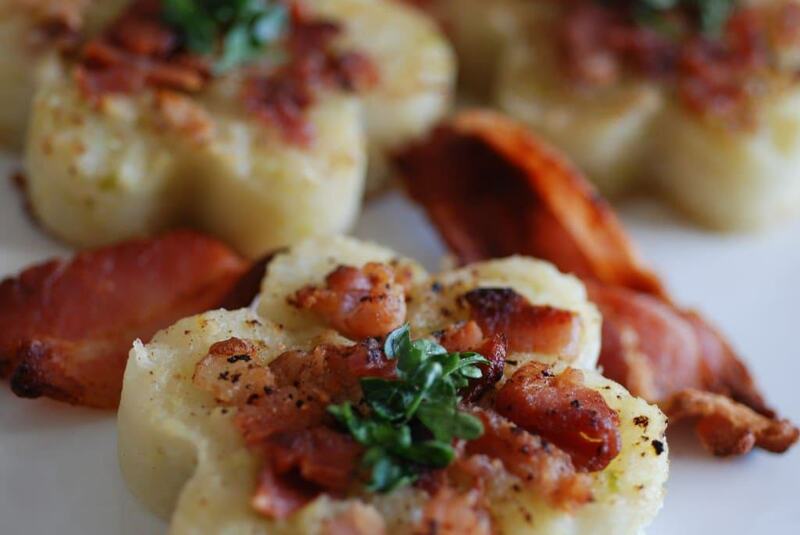 I had never mashed cabbage with potato before and it added a lovely sweetness to the potato. 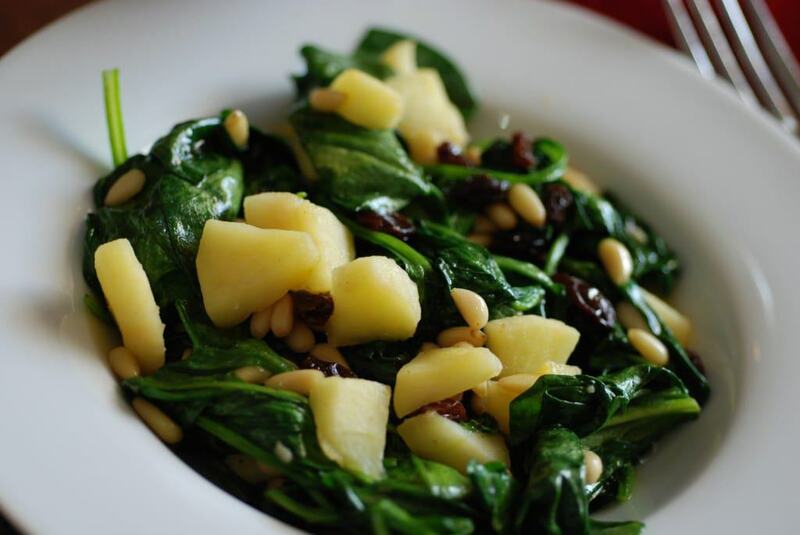 The quickly cooked apples in the wilted spinach (Espinaca dish) also added sweetness along with the raisins and the pine nuts provided interesting texture. For dessert, we savored the rich custard augmented with a citrus flavor. I garnished the dessert with an edible yucca flower I foraged from my yard. The yucca flower reminded me of the Andorran national flower, the Grandalla Narcissus Poeticus. We drank a lovely French, white burgundy Montrachet with our meal and dined Continental style, with the fork in the left hand, knife in the right, as is their tradition. I am intrigued with this little country called Andorra and hope one day to make a visit during one of their many festivals. I look forward to being offered a bowl of Escudella and to experience the sense of community they so graciously provide.